The Goat Rocks Wilderness drapes over the crest of the Cascade Range in South-Central Washington, offering endless views of iconic Cascade peaks and volcanoes. Numerous snowfields flank its craggy ridges and peaks, while steep drainages open into basins filled with alpine meadows and glacial lakes. Pacific Crest Trail hikers frequently say that Goat Rocks has the best scenery along the northern half of the 2,650-mile PCT. And, if you're quiet and lucky, you may see mountain goats. Embraced by both the Gifford Pinchot and the Mount Baker-Snoqualmie National Forests, and located just south of Mt. Rainier and just north of Mt Adams, much of Goat Rock’s 120-mile trail system stays on the ridges at or above timberline. Alpinists are drawn to the wilderness area’s highest point — 8,184-foot Gilbert Peak, which can be summited via a challenging but nontechnical ascent. But the window on these higher elevation adventures is tight; the snow often doesn’t melt until August and can reappear as early as late September. In general, end of July through October is the best time to hike in the Goat Rocks Wilderness. July and August are usually great for wildflowers, but that’s also the time when mosquitoes will be the worst. Use a combination of permethrin on your clothing and a small amount of 30% DEET on exposed skin for full protection. Mid-August through September can also be a good time to visit this area because crowds and bugs will thin out. Snowpack is a key factor for trip planning in the Pacific Northwest. Some years a heavy winter snowpack will keep trails covered into July. On warmer years with lighter snowpack, June backcountry trips are quite feasible. The same is true for autumn hiking, some years early snowstorms make this area inaccessible and other years it’s stable into October. As always, be prepared and diligent in monitoring current conditions as weather can change quickly in the mountains. Before heading out, check the National Weather Service for current conditions. We rate most backpacking trips in this region as moderate to difficult due to its many steep ascents and descents. As always, difficulty ratings depend on the route you choose, experience, physical fitness, pack weight, and weather conditions. Although most routes in Goat Rocks are not technically demanding, you should always plan thoroughly, train properly, know your limitations, brush up on your skills, and dial in your gear. Doing so will make for a more safe and enjoyable adventure. Wilderness permits are required for entry into Goat Rocks Wilderness within the Gifford Pinchot National Forest Agency. The self-issuing permits are free and available at all trailheads leading into the wilderness areas. You can also attain them at the Forest Service Ranger Station in Randle, Washington. The Packwood Lake and Berry Patch Trailheads require, in addition to a wilderness permit, a Northwest Forest Pass or Interagency Pass to park at the trailhead. A fee tube is located at the motorized trailhead below the parking lot. Call the local Ranger District office for up-to-date information, as requirements can change. There are more than 30 interconnected trails in the Goat Rocks Wilderness totaling about 120 miles. The most popular trails are the Snowgrass Trail and the Pacific Crest Trail, which intersect in Snowgrass Flat. The Gifford Pinchot National Forest Website is a great resource for trail information, including current snow levels, conditions, driving directions, and closures - which are frequent and ever changing. Because there is such a wide range of trails in the Goat Rocks Wilderness, the backpacking itinerary options are endless. You can access the beauty of Goat Rocks in a 2-3 day weekend trip, or plan an epic 4-6 day trip, allowing you to fully explore the region. Below we outline several itineraries to meet your group's needs. When backpacking in the Goat Rocks Wilderness, you should only camp in pre-existing sites. This helps to reduce resource damage and minimize human impact in high elevation/high use areas by concentrating visitor use to a few often-used sites rather than scattered sites throughout an area. In some areas, you’ll see a designated campsite marker on 3-foot high posts engraved with a tent symbol. One big issue we've encountered in the Lily Basin/Snowgrass Flat area is people failing to pack out human waste and even leaving behind toilet paper. Please do your duty to preserve this fragile environment by following Leave No Trace practices and pack out all your trash. Heck, gain a little trail karma and pick up some trash you encounter along the way. Green Trails Map 303s - We love Green Trails Maps. They offer all the necessary backpacking details in the Goat Rocks Wilderness including trail mileage, campsites, water sources, etc. National Geographic Trails Map #823 Goat Rocks, Norse Peak & William O. Douglas Wilderness Area - This map is a great resource filled with landmarks, roads, trail mileage, contour lines, and all the details you'll need to complete your trip. 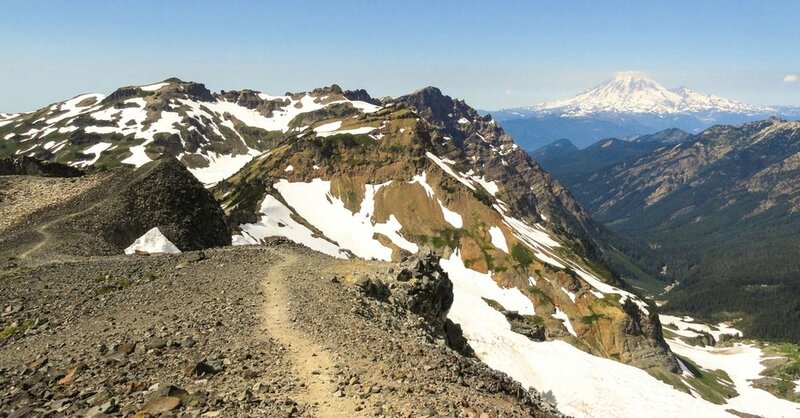 Hiking Washington's Goat Rocks Country: A Guide to the Goat Rocks and Lewis and Cispus River Regions of Washington's Southern Cascades - Extremely detailed hiking guide to the Goat Rocks Wilderness, offering 50 detailed hike descriptions. Additional information on geology, history, and wildlife round out this superb guidebook. Backpacking Washington - This region is covered in depth in the Backpacking Washington book. We use this resource to plan many of our backpacking trips throughout Washington. Day Hiking Mount Adams & Goat Rocks Wilderness - Though this book is focused on day hikes, it's a great resource for planning out which region you want to explore in Goat Rocks Wilderness. There are plenty of streams and lakes throughout the Goat Rocks Wilderness. It’s rarely a problem to find water, but we still recommend consulting your map to plan your water sources throughout each day. Water from backcountry sources in Goat Rocks must be treated. We carried the SteriPEN Ultra and we were happy with its performance. A lightweight water filter or chlorine dioxide drops or pills would be a good choice as well. Check out our best water purifiers’ list for our top recommendations. It's always a good idea to check with the Forest Service Ranger Station in Randle for the most current information on water quality and availability. When visiting the Goat Rocks Wilderness, we ask that you review and follow the Wilderness Regulations put forth by Gifford Pinchot National Forest Department to keep this region pristine and wild. Camping prohibited within 100 feet of the Pacific Crest National Scenic Trail and within 100 feet of lakes. Group size is limited to no more than 12 per party, in any combination of people and pack or saddle stock. Groups larger than 12 must split into two or more smaller groups and remain least at least 1 mile or 1 hour travel distance apart at all times. Shoe Lake basin and Snow Grass Flats are closed to camping and campfires; camping is available at Hidden Springs (about 1 mile west of Shoe Lake). The Yakama Indian Reservation, bordering the Goat Rocks Wilderness on the southeast, is closed to the public except for the Pacific Crest National Scenic Trail route. Waste must be carried out or dig 6- to 8-inches (15 cm) deep “catholes” at least 100 feet (30 m) away from water, trails and campsites to bury human waste. Pack out all trash and any you see left by others. Wash dishes, bathe and camp at least 100 feet (30 m) from water sources, trails and campsites. Collect and bag food scraps and pack out as trash. Dogs can be in the wilderness, but be aware of impact on wildlife and potential conflicts. There are few reports of animal or bird encounters in this area. That said, many people visiting this area set up a base camp, leaving gear and food items behind during day hikes. Please consider using a safe food storage container, such as an Ursack. Place your food and scented items inside of it when you are away from your camp or at night. Always follow proper storage techniques to ensure your food is safe and you're doing your job to keep wildlife wild. July and August is a great time to visit Goat Rocks, but you should be prepared for the possibility of mosquitoes, gnats, and flies. Use a combination of permethrin on your clothing and a small amount of 30% DEET on exposed skin for full protection. Mid-August through September can also be a good time to visit this area because crowds and bugs will be diminished. TENT: We used the Big Agnes Copper Spur HV UL2 tent on this trip. We love its combination of low weight and livability and that's why it's one of our top picks on our best lightweight backpacking tents list. BACKPACK: We used the Gossamer Gear Gorilla and the ULA Circuit backpack on this trek. They're both lightweight, convenient, comfortable, and make our list of the best lightweight backpacking packs. SLEEPING BAG: We used the Western Mountaineering UltraLite and the REI Magma 17 on this backpacking trip. They're both lightweight, incredibly warm, and makes our list of the best backpacking sleeping bags. SLEEPING PAD: We both used the Therm-a-Rest NeoAir XLite sleeping pad on this trip. It's light, comfortable, warm, and make our list of the best backpacking sleeping pads. COOKING SYSTEM: We used the Jetboil MiniMo cooking system and Snow Peak Folding Spoon on this trek, all of which make our top picks gear list and best lightweight stove list. WATER PURIFIER: We used the SteriPEN Ultra as our main purification method on this trip. It's lightweight, works fast, and doesn't require any pumping, squeezing or chemicals. Check out our best water purifiers list for our other top recommendations. SHOES OR BOOTS: We wore the Saucony Peregrine 7's and Altra Lone Peak 3.5's on the trail and they were excellent. If you prefer boots, make sure they’re lightweight and break them in really well before your trip. Here’s why we prefer hiking in trail running shoes: 5 Reasons to Ditch Your Hiking Boots. Also, here's our top picks for the best backpacking footwear. HEADLAMP: A small headlamp like the Petzl Actik is an affordable, bright, and lightweight option. FOOD: When backpacking in Goat Rocks you'll have to carry all your food. Check out our Best Lightweight Backpacking Food Guide and our Best Freeze Dried Backpacking Meals for some of our go-to recommendations. FOOD STORAGE: For this trip, we brought an Ursack to keep the critters out of our food. There are no food storage requirements for this area, but you should always store your food properly in the backcountry. Bear canisters and Ursacks are the most effective storage methods and the easiest to use. Here are some of our favorite hiking/backpacking clothing items from our Top Gear list. 1 Fleece jacket - Extra warmth under your down jacket that will be warmer when damp and better to hike in. 2-3 Pair socks (add thin sock liners if using boots) - Balega running socks for warm weather & SmartWool mountaineer socks for snow. 1 Pair long john bottoms - long john top optional for nighttime use. MAP & COMPASS: We hiked with the Green Trails Map 303s and found it to be an excellent resource. In addition, we always hike with a compass. SUN PROTECTION: Sunglasses (polarized recommended), sunscreen, and spf lip balm are an absolute must. We hope this guide helps you plan an awesome backpacking trip to the Goat Rocks Wilderness. It's one of our favorite places in the Pacific Northwest. If you found this guide helpful, please share on social media and give us a digital high five by clicking the little red heart below!